Wood is the easiest material to install since it’s the easiest to cut, drill and miter. This means that any person with basic carpentry skills could install one of our railing systems with ease. Since the top rail is the only section of the railing that you will constantly put your hands on, it is typically softer and smoother to the touch than metal. Wood will also not fluctuate in temperature the way metal does while metal rails can get very cold in the winter time and overly hot in the summer time. A metal top rail is of course the lowest maintenance selection. But there are many different species of wood these days that are considered little to no maintenance. We typically recommend IPE (Brazilian Walnut) for your outdoor application. IPE pronounced (ee-pay) is a very strong wood that is considered to be part of the “iron wood” family. IPE is so dense and heavy that if you toss a piece of it into a lake it will immediately sink. You can decide to oil IPE once or twice a year or you can always decide to just let it age naturally and it will turn a light grey in color. Plus the combination of materials (wood, powder coated metal, and stainless) just looks great! Whichever top rail material you choose for your railing applications please make sure it’s a strong one. 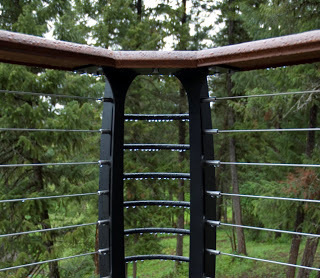 A cable railing has force factors involved that most railings do not. Therefore it is imperative that the top rail be very sturdy since it’s a key component of the entire railing design.